Roll Up is now being managed and delivered by the team at Bike n' Blend. Contact 0481 315 956 or email info@bikenblend.com.au for a quote today! Established in 2011 with funding from the VicHealth MOTION program, Roll Up is a fully outsourced, customisable, rider-oriented bicycle parking service. Requiring no permanent infrastructure, Roll Up fits on the street, on footpaths, in ovals or just about anywhere. We provide infrastructure and staffing to accommodate 200 bikes. 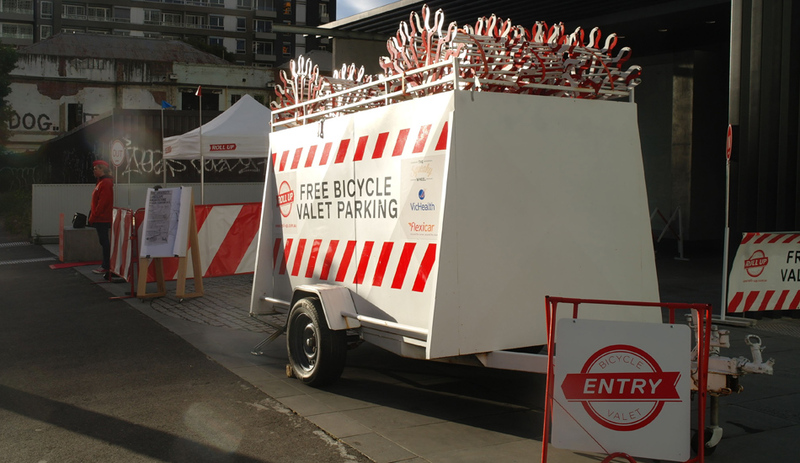 Located in close proximity to festivals and events, bicycle valet is a proven factor in encouraging active and sustainable transport. Run by bike riders for bike riders, Roll Up adds green value to any event, enhances the rider experience, rewards sustainable transport choices and promotes health through physical activity and community engagement. Roll Up is an ideal service for festivals, outdoor cinemas, community gatherings, street parties, sporting events, environmental events or rallies, exhibition openings, arts, music and cultural events, markets, launches or any occasion that brings people together.